As any parent knows, kids are an indefatigable lot and they definitely have a lot more energy than parents are able to keep up with. If you find that your kids have a lot of excess energy that you are eager to have them burn off, you may want to consider introducing them to Webkinz or Club Penguin. The two websites have a lot of attractions for kids to enjoy, and they will certainly find plenty to do to keep them occupied, as you will see in this comparison article. Webkinz is a website that aims to offer a unique combination of retail merchandise and the interactive experience of a full-blown virtual community, and we have to say that it succeeds on both counts. The site works with a plush toy that comes with a secret code, which is used to unlock a membership to the Webkinz virtual world. Here, users have access to loads of games, and they have the chance to earn “kinzcash” as well as chat with other players. Club Penguin is a subscription based site that features a snowy virtual world where kids aged 6 to 14 can play a host of games, adopt “puffles”, and otherwise interact with other players. Also provided is the opportunity to customize player igloos. In 2010, prices for the Webkinz toys start at $13. Club Penguin for its part offers accounts that range in price from $6 a month to $58 for a yearly subscription. 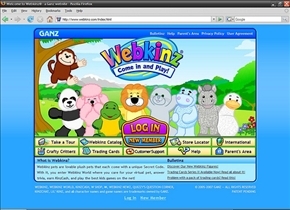 There has been a fair amount of criticism leveled at both sites, with Webkinz having come under fire from various parent and consumer groups with regard to the use and abuse of the site’s toys. The common worry is that children tend to become addicted to the games, but more serious concerns have to do with the risk involved in chatting with strangers online. That being said, Webkinz does have safety measures in place that restrict the ability of strangers to send messages and otherwise communicate with young users. 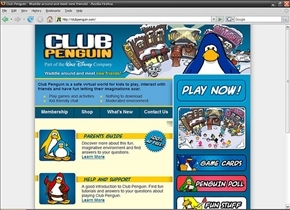 As for Club Penguin, much of the criticism stems from the fear that the site encourages consumerism in young children, and that it teaches players questionable "skills" such as cheating. To its credit, Club Penguin does not require players to spend real money, although the fact that players can win by cheating and using shortcuts has been a constant point of contention with parents. Which kids site is more fun to use? I go on bolth and i hate cp. GO WEBKINZ! How Can Some On Hate Club Penguin I Don't Like Webkinz A Lot And I Speak The Truth!!!! [ Sorry Webkinz But I Like Club Penguin Better ] Club Penguin Is Free While You Need To Pay For A Webkinz Before You Play Its Not Fair!!! And I Crash My Computer On Webkinz While Club Penguin Has A Beta Team That Fixes Problems While Webkinz Dose Not Even Tell You Club Penguin IS So Much Better Plus You Can Chat On What You Want On Club Penguin And You Can Let Other Players Into Your Igloo So If You Ask Me Which One Is Better I Say Club Penguin!!! Go Club Penguin! The ads in Webkinz are very annoying. They get in your way and when you accidentally click on it it freezes your computer, well even without the ads webkinz would still constantly freeze. It's very frustrating.